We officially announced the 2014 winners of our annual 180 Medical College Scholarship on August 1st, 2014, and since that time, we have been featuring our nine individual recipients as the fall semester progresses, including Nichole, Danielle, Garrett, Ian, and Chelsea. 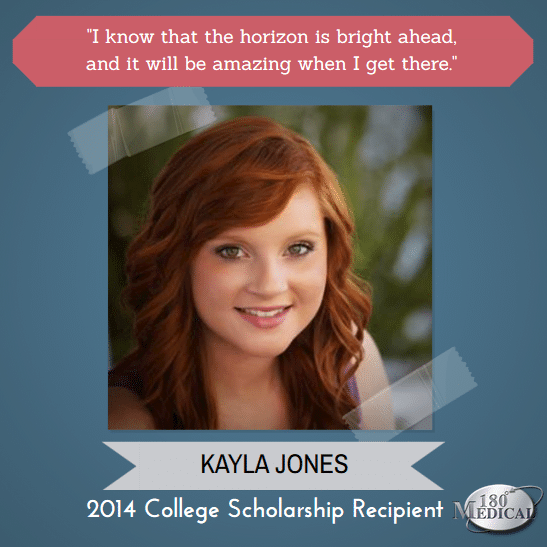 Today, we are proud to introduce you to Kayla, one of our inspiring scholarship winners. Kayla was born with Spina Bifida Occulta, where an extra bone in her back severed her spinal cord and damaged the nerve that ran to her left foot. At just three months old, she had surgery to correct her spine and foot – the first of many surgeries in her life. Throughout her life, she continues to work hard to defy the odds. In high school, she received numerous awards and honors, such as the Superintendent’s Rigor Award and the Phi Theta Kappa Honors Society. She also stayed very busy with extracurricular activities, clubs, and community service, such as DECA, FBLA, Spanish Club, Beta Club, Prom Committee, and more. On top of that, she has stayed active with sports, including JV and Varsity basketball and JV softball. Kayla, who has just entered her Freshman year as a major in Public Policy at the University of Virginia, has kept a fiery spirit of determination and a positive outlook. We here at 180 Medical are awed by her story and her optimism, and we’re excited to play a part in contributing to her bright future. Did you know that this month is National Spina Bifida Awareness Month? Learn more about this condition today and find out ways to spread awareness. Meet one of our nine amazing scholarship winners, Chelsea and learn more about her story and the goals she plans to achieve in college. Come meet the last of our 2014 Scholarship Winners, Elena. She’s got big goals to achieve, and we’re excited to play a part in contributing to her future. Meet one of our nine amazing scholarship winners, Noah, and learn more about his achievements and goals.